The much-anticipated inauguration of Buffalo State’s ninth president, Katherine S. Conway-Turner, will be held on Tuesday, October 21, at 12:15 p.m. in the Performing Arts Center at Rockwell Hall. 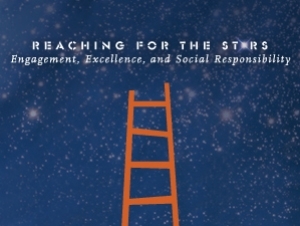 The inaugural theme, “Reaching for the Stars: Engagement, Excellence, and Social Responsibility,” will be reflected in a full week of activities starting with the Student Union Bash on Tuesday, October 14, from 12:15 to 1:30 p.m. in the Campbell Student Union. Performances from student groups, including the SPIRIT Gospel Choir, STEP Expression, and the CSO Dance Team, will highlight the celebration. A DJ from WBNY will play music, and there will be giveaways. Also, visitors can taste an assortment of orange-themed foods, including popcorn, candied apples, cotton candy, and cake pops. Inauguration of Katherine S. Conway-Turner, Ph.D.
Find the link to RSVP and details for inauguration marchers at http://president.buffalostate.edu/inauguration.